With so much well deserved attention going to the men’s basketball program and their unexpected and impressive 14-5 (5-2) start, I think it is about time that we give the women’s team some some recognition as well. This season has not been quite as glamorous for the Lady Ducks as it has been for the men. The team currently sits in the 11th spot in the Pac-12 at 10-8, and are 2-4 in the conference. Though it is a down year for the Ducks by typical expectations, the team has some big non-conference wins that should not go unnoticed. The first began when the team beat a tough Illinois team 77-74 in Eugene. The women also got a big 89-77 blowout win at home against UC Irvine, and just before conference play began, the Ducks women’s team defeated the University of Portland 88-78. For women’s basketball, the Pac-12 Conference is a very tough conference to play in, one of the top leagues in the country with one clearly dominant team overshadowing all others. Year after year it seems like Stanford out-plays all competition and wins the Pac-12, going on to the Final Four, and this year does not seem to be any different. The Cardinal is off to a 15-1 start, and are an undefeated 6-0 in conference play. The Ducks only have two wins in the Pac-12, but the wins came against a good Washington team, and a talented Arizona team. Oregon did however take a bad 93-70 loss to Stanford back on January 5, though few teams can keep up with Stanford this year. This has not necessarily been a down year for the Ducks solely because of poor play, it has just been an injury-plagued season leaving the team with a thin depth chart, a repeat of last year when raised expectations were dashed with a rash of injuries. The Ducks have been without their leading scorer and rebounder Amanda Johnson since December 11th when she fractured her thumb in the loss to Denver. Before her injury, Johnson recorded six double-doubles in nine games this season, along with eight games in double-figures and averaged 21 points per game, ranking her 16th in the nation. Freshman center Janitah Iamaleava has missed the entire season after injuring her left knee in a pre-season practice. Before two knee injuries sidelined her for the final nine games of last season, Nia Jackson led the Pac-10 in scoring and assists, averaging 17 points and 5.7 assists per game. Despite missing the final half of conference play, Jackson was named to the 2011 Pac-10 First Team and the 2011 Media All-Pac-10 Team. With Jackson in the lineup, the Ducks were 12-9. Without her, the team is 1-8. This year, Jackson is averaging 9.6 points and a team-leading 3.6 assists per game. 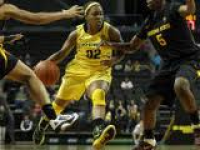 Jackson’s 185 career steals rank fifth all-time at Oregon, and her 320 career assists rank ninth. Jackson has delivered at least six assists on four occasions this year. Senior Jasmin Holliday is averaging a career-best 15 points per game. Holliday has led Oregon in scoring on six occasions, and has led the Ducks on the boards a team-best nine times. She also leads the team with 15 double-figure scoring games, and set a new career high, scoring 26 points in a loss at Nevada on Dec. 14. This women’s team has a tremendous amount of talent, they just seem to have trouble staying healthy. In addition, the women’s team, a lot like the men’s team, has lost games this year due to a lack of defense down the stretch. Nine times this season, Oregon has allowed an opponent to knock down at least 10 three-pointers in a game. This year, the ladies have allowed opponents to hit 178 long-distance shots as opponents are shooting 37 percent from 3-point range. In the last 13 games, an opponent has had an individual player knock down at least five three-pointers on 11 occasions. But if there is one thing coach Paul Westhead has taught his team to do well this year, it is to play fast. In Westhead’s three years at Oregon, the Ducks have finished in the country’s top-15 in scoring in back-to-back seasons, averaging 81 points (2010, 2nd) and 73 points per game (2011, 15th). Not to mention, Oregon’s 8 three-pointers per game rank first in the Pac-12 and 10th in the nation. The Ducks finished third in the country averaging 8.5 three-pointers per game in 2011. In the game against ASU the Ducks had second half troubles, and as a result lost to Arizona State 53-49 in Eugene. However, senior leader Nia Jackson stepped up for the Ducks. She was fouled with 20 seconds to play and made the layup and the free throw to secure the three-point play, bringing the score to 50-49. But it was too late for the Ducks as they had to foul and ASU made the crucial free throws to seal the victory. The Ducks took on USC in Los Angeles at the Galen Center Thursday night in a close contest. To give a bit of history on this women’s series; USC holds a 39-17 advantage all-time against Oregon, and currently the Trojans have won the last four games between the two programs. Oregon is 6-23 in the all-time series in Los Angeles, and has won just once at the Galen Center, 85-77, on Jan. 30, 2010. In that game the Oregon great Taylor Lilly scored 36 points and set the Oregon single-game record with nine three-pointers, a memorable performance for a player that surely will be honored in the Oregon Hall of Fame someday. Ducks matchup against UCLA last season. Up next for the Lady Ducks is a battle with UCLA at 1 p.m. today (Saturday, 1/21) at the John Wooden Center in Los Angeles. This will be the one and only meeting this year with the UCLA Bruins, as the expansion of the conference to 12 teams has eliminated the guaranteed home-and-home series every year. The Lady Ducks lost both games against the Bruins last season. The first was an 87-57 loss in Pauley Pavilion in Los Angeles. The second time, the Ducks lost at home 75-48. If the Ducks are going to beat UCLA they have got to do a better job on the defensive side of the ball, and they have to outrebound UCLA as well as getting good looks at the basket, converting quality shot opportunities. When Oregon has out-rebounded its opponent this season, the Ducks have a 6-1 record, scoring 83 points per game, and averaging 72 field goal attempts per game. However, when Oregon is out-rebounded, the Ducks are 4-6 and average just 72 points per game attempting 68 field goal attempts per game.